It’s been a while but there’s a show in the Opera House once again!! 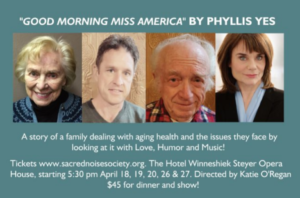 We are so excited to host the Midwest Premier of Good Morning Miss America, an original play by Luther alum Dr. Phyllis Yes! Premiered on the west coast to rave reviews, the show tackles issues of aging parents with humor and insight. Performers from New York City, Waterloo, Washington, and Decorah are sure to deliver a night of great food, theater, and maybe a drink or two! Get your tickets for dinner and a show by April 12th at sacrednoisesociety.org!